Here are a few helpful tips on how to navigate Recitherapy without having to struggle taking your eyes off the delicious photos to find what you're looking for. It can be quite a battle! WANT TO PRINT A RECIPE? 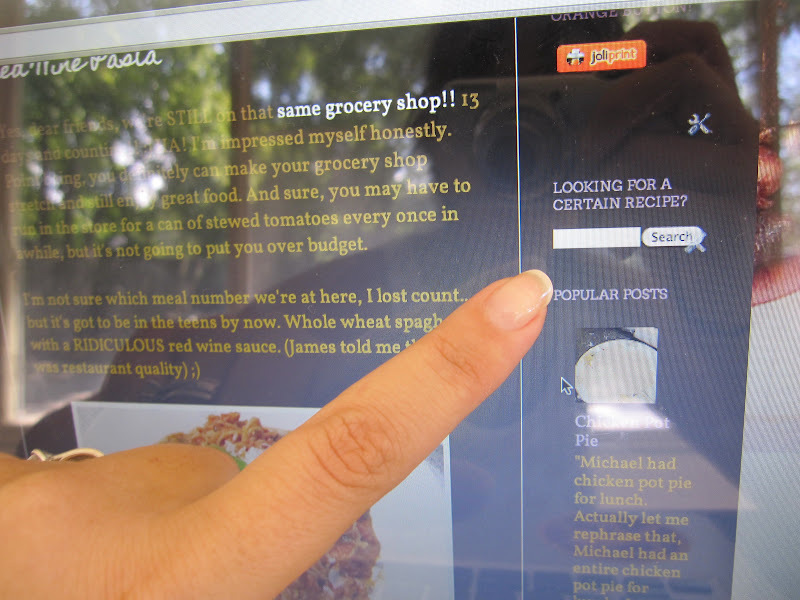 Click on the title of the post you want to print then just go over to that little orange button on the right hand side! Ta Da! Do you have too many black beans on your hands and don't know what to do with them? Type in "black beans" in the little search bar on the right hand side and all of my posts that have black beans in them will come up! Pizza recipe? Type in "pizza" and you're all set! NO CLUE WHAT TO MAKE FOR DINNER TONIGHT? 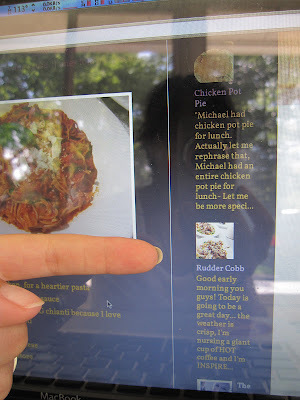 Check out the most popular posts listed on the ride hand column and see if anything strikes your fancy! HAVE TOO MANY BLOGS AND SITES TO LOOK AT AND CAN'T REMEMBER THEM ALL? Click on that pretty, flashing Eiffel Tower at the bottom left of the page and join Bloglovin'. 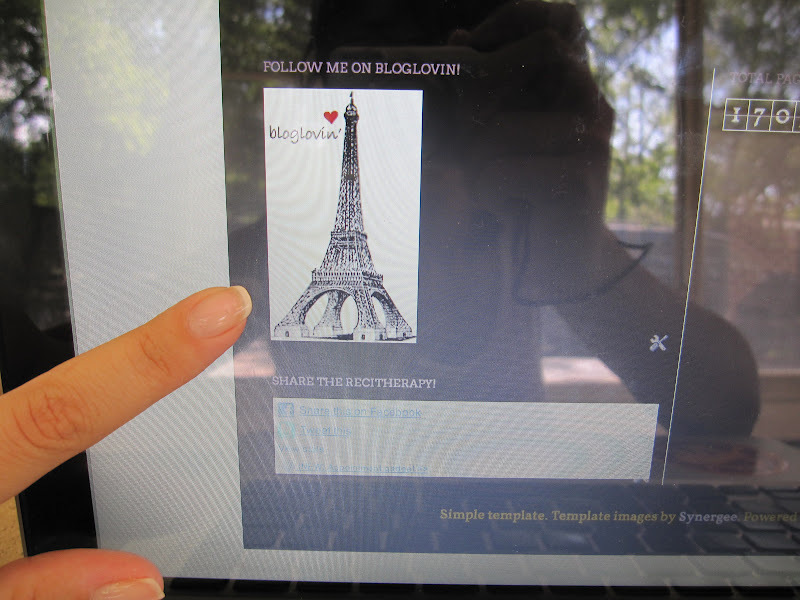 Bloglovin allows you to add all the blogs and websites you follow together in one place and lets you know when one of them has a new post! One stop shopping! I've just recently joined myself and it is HELPFUL. WANT TO SHARE THIS RECIPE WITH YOUR MOM IN KANSAS WHO JUST HAPPENS TO BE MYSTERIOUSLY OBSESSED WITH FACEBOOK? 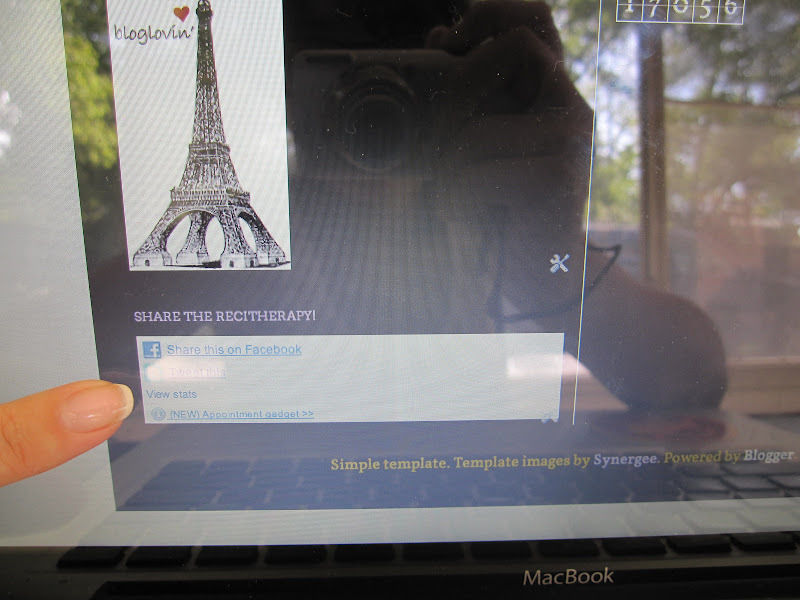 Click on the little white box on the bottom left to share a page of Recitherapy with your friends on Facebook or Twitter! 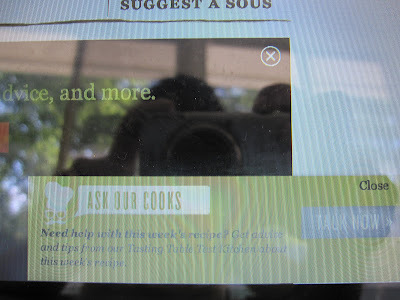 It reads, "Need help with this week's recipe? Get advice and tips from our Tasting Table Test Kitchen about this week's recipe." What? No way! So you click the "TALK NOW" button and sure enough, it takes you to a form where you simply type in your e-mail address, your phone, if you want, your name and your question! And it doesn't have to be about this week's recipe. It can be anything! THEN, they answer you within the hour. HOW COOL IS THAT? And one more thing I discovered today... Do you remember that awesome avocado hummus spread we made the other night for burgers and chicken sandwiches? 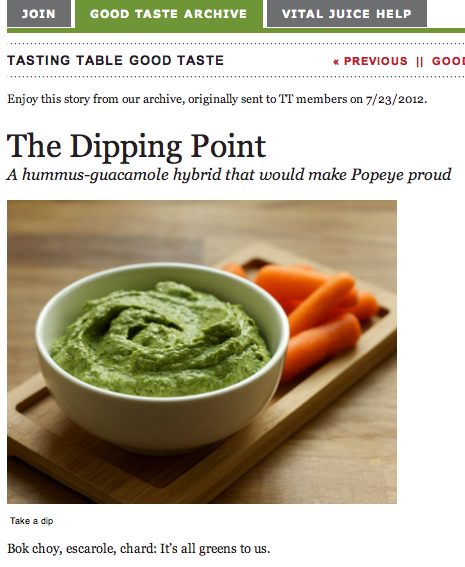 Check out the "latest idea" on Tasting Table's website today! It looks like we're ahead of the game over here at Recitherapy. 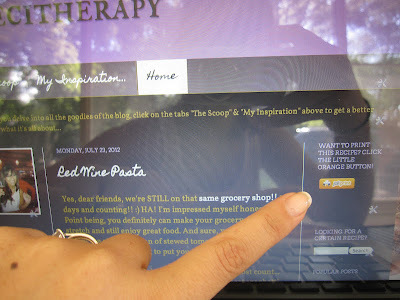 ;) Enjoy your new bloglovin and Tasting Table adventures... and be sure to try out all those buttons here on Recitherapy! Great tips! I learned a few new things :0) Thanks!